So far, we have spent a great deal of time in this series discussing how the covenants of the Bible fit together. You can see it graphically represented in the following diagram. The big question is -- how is this useful, and what does it have to do with rebooting Christianity back to the church it was intended to be? The key point of understanding covenant layout is to understand which topics in the Scripture apply to whom. Many atheists have pointed out the hypocrisy of using a Levitical passage about homosexuality while ignoring the passage a few sentences later about eating shellfish. And you know what...they are absolutely correct. It is hypocritical. The fact is that most Christians fail to understand that the Bible is a series of covenants and, as such, fail to comprehend which covenants apply in which situations. There are people today for whom the Levitical commandments are very important, and to which they are going to be held. There are others for whom it is irrelevant except to demonstrate our inability to match up to God's vision for our holiness. With that in mind, what does the typical American, Gentile Christian need to do to be considered a Christian? To which covenant(s) is he bound? 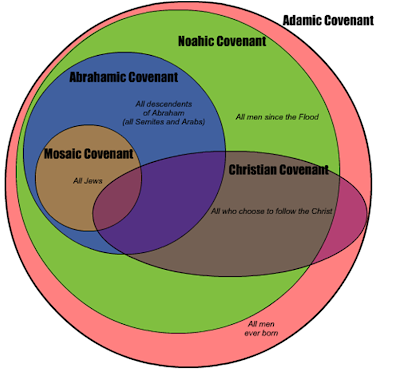 As demonstrated above, a Gentile Christian is bound to the Adamic Covenant (descended from Adam), the Noahic Covenant (descended from Noah), and the Christian Covenant (chose to follow Christ). A Jewish Christian is bound by the all of the covenants; an Arab Muslim, to the Adamic, Noahic, and Abrahamic. The New Covenant does not apply to everyone, only those who choose to follow it. Those who choose not to do so should not be judged by Christians for their choice--it is truly their choice, free to make. The New Covenant happens to be the only covenant ever made between God and man where God offers us a chance at eternal life with Him; thus, it is a covenant of Good News! Truly a Gospel, and it is this grace that we should be preaching. But if you do not understand covenant theory (and most of modern American Christianity does not), what then are our options? If you study all of God's commands and get them mushed up in your head, such that you apply them where unintended, what is the result? The result is that you will be a judgmental, inconsistent, hypocritical people who tend to focus on the overwhelming Law of the old covenants rather than the freeing and forgiving Grace of the New Covenant. Church, Jesus came to free us of these old covenants; let us not make the mistake of leading people back into them! 1. Be fruitful and multiply (Adamic Covenant) - definitely fulfilled by humanity, perhaps too much so! These ten acts are the covenantal terms and conditions to which we are held. Your acceptance of these covenants are demonstrated by the following witnesses: your partaking of the Eucharist, and being baptized. Note the conspicous absence of a law-based ethic system here. This is all based upon showing love and forgiveness...the 'commands' we are given in this covenant are not works-based, but loyalty-based. What truly good news! Let us share this great news with those around us, and not be so foolish as to hold people accountable for sinning against covenants to which even God does not hold them!